For Beginners and those who want to know the basics behind these miracle machines. Drones are in the news almost daily with millions being sold and flown. However, many are not familiar with the mechanics of how they work. This article will provide a basic explanation of the systems that keep a modern Camera Drone flying. Some fancy words…for sure! An example might help. Most modern automobiles have anti-lock brakes which use various sensors and computers to acheive a better result than a human driver would. Based on the slippage of the tires, the steering angle and other such inputs, the anti-lock systems makes decisions which help your car stay on the road. It is only the combination of these sensors (sensor fusion) and the proper programming which makes the system function as intended. Radio Control between the ground and the drone. Keeping the drone AND the camera steady and under control results in the desired end – butter smooth video and stunning photographs. 1. 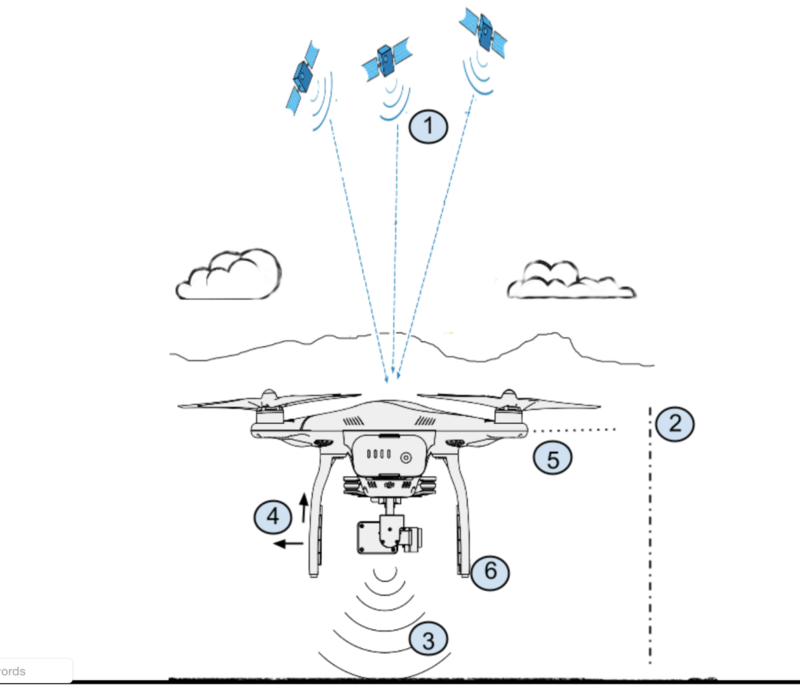 The GPS gathers satellite data in order to determine the position of the Drone – this data is also fed into the main flight controller. Advanced models such as the Phantom 3 Pro read both USA (GPS) and Russian (GLONASS) satellites, resulting in much more accurate positioning than previous models. 2. A Barometer measures the pressure in the air, which help the Phantom know its altitude above the ground. 3. Sonar sensors and a bottom facing camera combine to help advanced models (Phantom 3 Pro, etc.) know where the ground or floor is when it is within 9 feet of the ground. This system is helpful for indoor flight when no GPS is available. 4. Accelerometers inside the Drone sense whether it is moving through the air. 5. A gyroscope helps keep the Drone body level during flight. 6. A compass keeps basic track of which direction the Drone is pointing. It is the combination of all of these sensors and inputs that results in a flight systems which is extremely robust and reliable. However, the instruments by themselves are of little good without programming and computing power – that’s where the flight controller (F/C) comes in. This is the central computer of a drone and it performs many thousands of calculations per second. 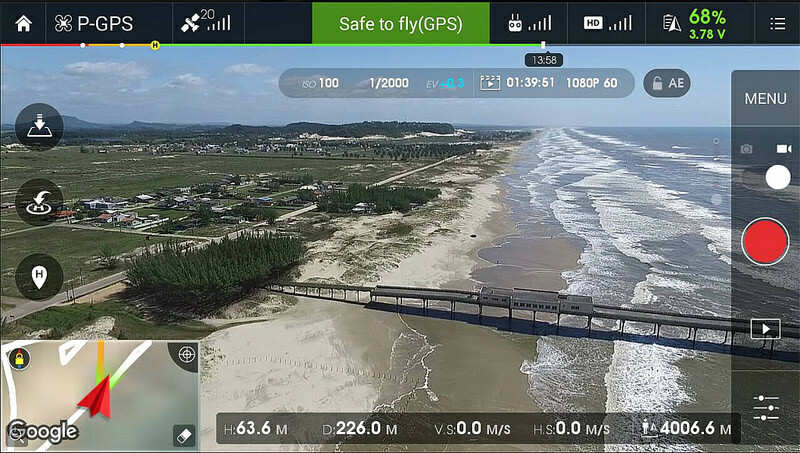 If you were able to look from above down into your Drone, you’d first see the GPS system which is located in the top center hump of your quadcopter. Underneath that is the flight computer along with the main IMU (Inertial measurement unit) which contains some of the instruments mentioned previously (#2,#4 and #5 in the list). This board also contains the radio receiver and transmitter which help your Drone communicate with the transmitter and smart device back on the ground. 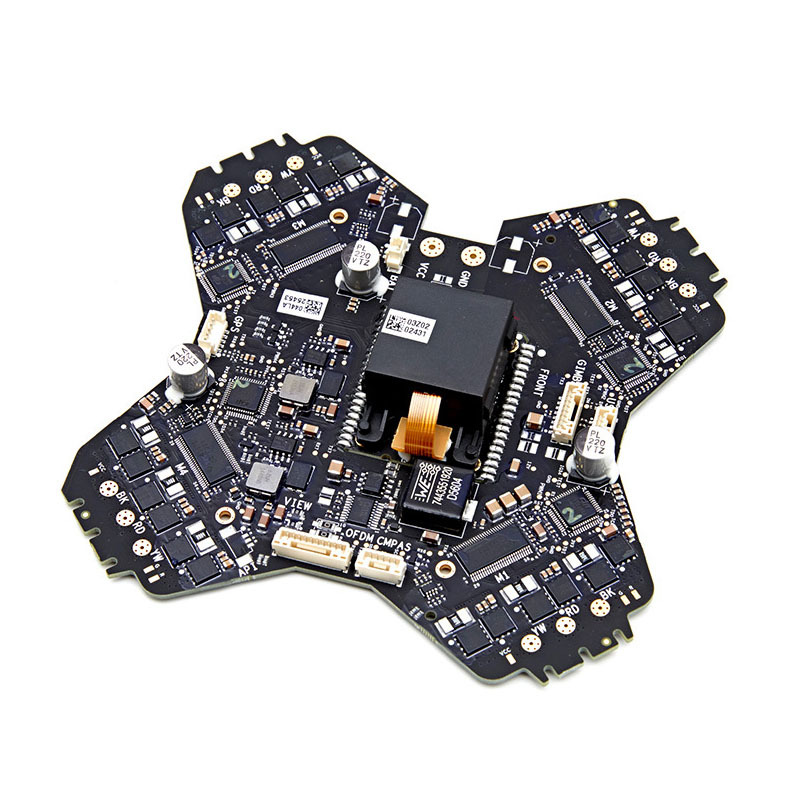 Other parts of the main system board contain the “ESCs” (Electronic Speed Controllers) which provide power to the drone motors. The Battery is usually located below the Flight Controller and provides the energy to power all the electronics and motors of your Phantom. It also contains intelligent circuits which monitor its charge, temperate and other data. The stabilizer, or gimbal, which keeps the camera steady and vibration-free is a wonder of engineering in itself. We have written a separate article here which explains the operation of brushless camera gimbals. Note that similar electronic components ( IMU, EMS )mentioned in our gimbal article are also used for for stabilizing the main body of the quadcopter (#2,4 and 5 above are EMS – tiny electromechanical devices). It may be helpful to think of the original Nintendo Wi as well as your Smartphone when trying to understand the gyroscope and accelerometer chips. These low cost Electromechanical Systems (EMS) are what has made drones – as well as fancier video game consoles and smartphones, possible. An EMS (gyroscope) is how your phone knows to switch the display from landscape to portrait. Another EMS (accelerometer) knows how fast you are swinging your bat on a Wii or similar handheld video controller. 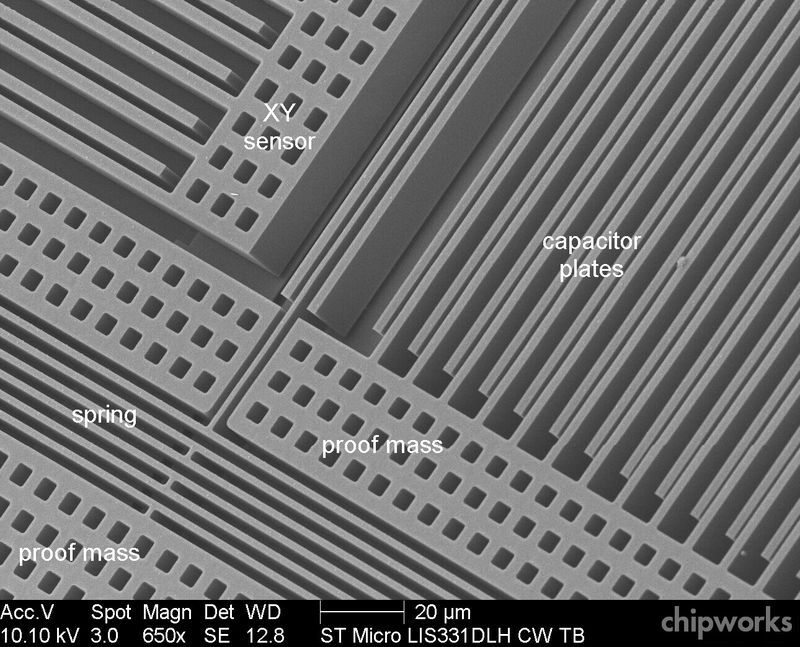 These amazing devices are a combination of mechanical (moving parts) and electronics all wrapped up in a tiny package. EMS chips are enabling the so-called IOT (internet of things), with wearable and other devices that are able to sense their environment. If you want to learn more about these devices check out Invensense, one of the major manufacturers of these devices. Most toy and racing drones lack two of the systems described above – the barometer and the GPS. Without a barometer, a drone will not maintain a stable height above ground without constant manipulation of the controls. By the same token, the lack of a GPS will allow a Drone to be blown away with the wind unless the operator is expert at manual control to counter the force of the gusts. Drones without GPS and Barometer are not really drones by definition since they are incapable of autonomous (automatic) flight. These models need to be actively controlled on a second by second basis in order to avoid crashing. The last piece of the puzzle involve the communication between your camera drone and your ground station (tablet/remote controller, monitor, etc.). This is done using a system similar to what is used for a local wireless network. The drone and the Remote both contain antennas which constantly beam information back and forth, allowing you to view what the drone sees, control the camera and monitor certain onboard systems such as the battery level. The term Telemetry refers to this two-way status information such as battery levels, distance above ground, heading and other such data. Older and less expensive drones often lack this type of data – leaving you flying blind and hoping your battery level doesn’t run low when the machine is far afield. Note the screen shot below which shows many different pieces of information about the flight and drone status. Note – Our eBooks on Amazon may help you if you want to learn more about the basics of hobby drones and/or the Phantom series. I hope this helps with your understanding of these amazing aerial robots. Below are some links to popular camera drones on Amazon and DJI’s sites – note that Droneflyers.com is an affiliate, meaning we make a small commission (without costing you more!) from sales made when you use our links. We use this income to run the site, purchase models for review and to publish our drone books. DJI Store – complete selection of camera drones from $400 up.